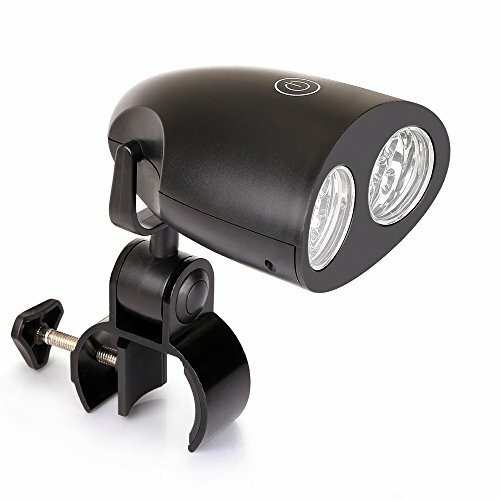 With this great BBQ light, grilling at dusk and dark is no longer an issue. No button to press with meat juice covered hands, turn it on by tapping the painted circle switch on top of the light. You would be amazed at how well this gadget light up your BBQ grill at night so can see closely how your meat is cooking, no more over or under cooked meat. It's also a versatile light which can do a lot more than just attach to a barbecue grill handle as the clamp will attach to a wide range of cylindrical, pipe-shaped objects. The battery cover has to be removed using a small Philips screwdriver. Inside of the battery compartment is a black pull ribbon that you should make sure is in the right position when you insert batteries. It makes it a lot easier to remove the batteries when they are dead. 【DURABLE & HEAT-RESISTANT-Build with ABS materials】 You're grill sits outside in the elements and sometimes, you forget to cover it. You might leave this light attached to your grill handle-that's ok because we've built it to last. It can handle the punishment of daily use. 【VERSATILE, EASY TO SET UP & USE】 Simply fasten the Kohree Bright Barbecue Grill Light to one of your grills and you'll make cooking so much easier. It is with fashion design, 190 degrees horizontal and vertical adjustment for perfect position. Adjustable C-Clamp fits most grill handles up to 1.65" DiameterIt is a necessity when you doing the barbecue. 【Satisfaction GUARANTEE】 If you are not satisfied with our barbeque grill light, please contact us immediately, we surely will offer you a satisfied solution.